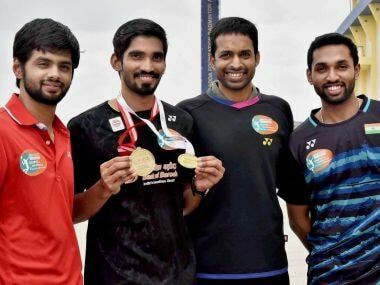 Hyderabad: Shuttlers Kidambi Srikanth, B Sai Praneeth, HS Prannoy along with Chief National Coach P Gopichand were on Tuesday felicitated by Telangana Governor ESL Narasimhan. 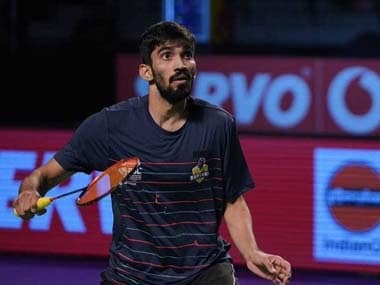 Srikanth bagged back to back men's singles titles at the Indonesian Open Super Series Premier tournament and the Australian Open Super Series event. Recalling that he had spotted a spark in Srikanth one year ago during the felicitation of shuttler PV Sindhu, Narasimhan, who is also the Andhra Pradesh Governor, said the young player has now proved him right. He said aspiring sports-persons have nowhere else to look but within the country as it has excellent sports infrastructure like the Gopichand badminton academy, according to an official release. Speaking on the occasion, Gopichand said it was a privilege for them to come to the Raj Bhavan for felicitation. Gopichand also said many people do not know that he had requested the Governor to save the Academy and that the Governor has generously helped the institution overcome the troubles, according to the release. He recalled that the corporates did not believe him those days and the Academy struggled to stand on its feet. Srikanth's parents Kidambi Krishna and Radha were also felicitated on the occasion. Sai Praneeth recently won the Singapore Open and Prannoy defeated few top players in recent times. The shuttlers were complimented by sports administrator V Chamundeswarinath at the Gopichand Academy earlier in the day. Srikanth and Prannoy were also felicitated by the IDBI Federal at the Academy and also presented with the prize money under their programme, Quest For Excellence, in association with Gopichand.